Image via Flickr Creative Commons, courtesy of Anamorphic Mike. Since the boom of the digital age, would-be writers have been practically coming out of the woodwork. Everyone wants to be a writer and hey, I can’t blame them. Sweet gig if you can score it. Yet, many of these eager folks are ill-prepared for the reality of what all an author’s job entails and this job is so much more than simply writing the book (though that is a saber-toothed bugaboo all in itself). The first three books you write likely will be total crap. Don’t get too attached. You can’t do this for the money. Book signings are WAY overrated. Remember to put on pants when leaving the house. Me, being a total neophyte completely rolled my eyes because I knew *flips hair* that I was the exception. Yeah about that. Frankly all of this is seriously excellent advice, especially the part about the pants. But why am I mentioning all of this? Well, I decided to become a novelist…in 2002. I just published my debut fiction…Tuesday. As in of this week. Granted, I did take a side-trip. I knew social media was going to be a MAJOR game-changer for authors. All the people I saw teaching how build a platform were insisting writers turn into marketing robots that shoveled out spam faster than C-Span shovels out BS. And I knew their approach would be more successful at turning writers into cutters than actually selling any books. For me, becoming a branding expert for creative people was a moral imperative…a calling. Just not my original calling. I recall a conversation with a friend back in 2011. She was laying into me that I needed to work on my fiction. My answer? My years of blogging and being a social media expert and craft teacher kind of remind me of the movie Karate Kid. Instead of writing glorious novels that became instantly famous and were made into movies? Here was Kristen…. Wax on. Wax off. Wax on. Wax off. But, I was willing to do it (yeah that hadn’t happened before). Sure technical writing, and editing and blogging and writing social media books wasn’t making me a novelist…but I sensed it would get me there and that it was MY road. The road that I needed. The one involving way more @$$ kicking. Granted, if I am brutally honest, there is a part of me that feels like a complete loser that it took FIFTEEN years to become a novelist, but I wouldn’t change how this all happened because this seriously long@$$ journey changed who I was. It shaped this undisciplined, self-centered, unlikable, lazy pile of wanna-be-hack into an actual honest to God pro. Before I decided on “author” I tried a lot of things. Hell, I wanted to be frigging everything when I grew up. I loved ballet. I wanted to be a dancer. I loved being on stage. But the bleeding, wrecked, blistered feet? Practice six days a week for four hours a day? Working my a$$ off just to end up in the background waving a rose? Then I was going to be a doctor. Loved me some science. Even won a military scholarship to become a doctor. I looked seriously cool in the white jacket and practiced signing Dr. Lamb…and deliberately making it messy because who the hell ever heard of a real doctor with legible handwriting? All was cool at first, but then I had to start dissecting stuff. I’m not squeamish at all. Hell, my mom is a nurse. But then I hit a crossroad in Majors Biology with, of all things? A starfish. The super smart Indian kid next to me in lab? His starfish was PERFECT. Like razor lines and every tiny organ laid out and delicately pinned in artful perfection. My starfish? It looked like it got drunk then called Chuck Liddell a p***y at which point said starfish got pounded into paste…then peed on. And what I realized was that, while science and medicine “in theory” fascinated me, I just wasn’t in love with the process of getting any good at it. Hell if I did that to a starfish? Yeah. Probably best not to let me near people. There is a point in all of this and hopefully one that you guys will find helpful. I certainly had aptitude for all the careers that interested me, but I lacked one critical element—love for the process. Was I willing to do anything for however long it took to get good at it? Really good. Maybe even the best? Nope. That was, until I decided to become an author. Then everything changed. There is this myth perpetuated by popular culture that talent is vitally important, when in actuality it is highly overrated. People seem to believe that if we are skilled with language then magically we’re capable of creating a work spanning 60K-110K words as easily as breathing. They seem to think anyone with command of their native tongue can whip out a novel, no problemo. Writing is EASY! No, writing is not easy. It is a craft. We are builders. But instead of getting wood and nails and sheetrock and concrete and crews of people helping us build? We are tasked with creating entire worlds from various combinations of 26 letters…alone. It’s a skill and it often has a long and brutal apprenticeship filled with blood, tears, rejection, and too much box wine. We get down on ourselves because friends and family, six months after we start, are certain we’re a failure because we aren’t toppling J.K. Rowling out of her top spots on the best-seller lists. But this is why loving process is critical. When we love the process, we keep at it. We learn all we can. We are willing to tweet and blog and maybe even figure out what the hell is so interesting about Instagram. We learn to ignore the naysayers. We gut through the unfun stuff because love fuels all we do. It has to. I am not particularly worried about the millions of other “published writers” because many won’t be in it for the long haul. A lot of them are there for the cover, the book in hand and a “signing” and “launch party” and nothing wrong with that. It is their fun. Not all dreams are meant to be life callings. But, often when these sort of folks discover this isn’t all a giant unicorn hug? That sure we authors can get raving 5 star reviews, but we can also get raving ONE star reviews from lunatics who have nothing better to do than be cruel and crush a writer’s will to live? Or maybe they are pretty good writers, but they don’t want to do the unfun stuff like building a platform (which actually IS a lot of fun if you do it the way I teach it). And these folks will languish in Amazon purgatory because they only loved part of the process, the fun parts. Some will invest years and never get there and give up because it is taking too long. Heck took me 15 years. I can appreciate that kind of discouragement. So yes! My romantic mystery thriller is finally out and available for .99 on Kindle (just click the cover pic above). We will do more official “launch” stuff next week. And thank you kindly for sticking with me these many long years. You have no idea how many times I would have given up had it not been for this blog, knowing y’all were there in the trenches rooting for me. So THANK YOU. In the end, lighten up on yourself and give yourself a break. Not too much of one. You still need to get your tail to work. But remember everyone has their own road, their own journey and process and keep your eyes on YOU and YOUR work. What are your thoughts? Do you get discouraged with the process of writing? I know I do. Would be awesome to just spend 8 hours a day making up stories but there is a lot more to this. Do you maybe feel better if you believed you were taking too long? 15 years is a tough number to beat, LOL. Did you have a similar experience? Did you try a career you thought you’d love but then went…yeah NO. And to prove it and show my love, for the month of MAY, everyone who leaves a comment I will put your name in a hat. If you comment and link back to my blog on your blog, you get your name in the hat twice. What do you win? The unvarnished truth from yours truly. ***April’s winner is Carl D’Agostino. Please send your 5000 word WORD document to kristen at wana intl dot com. Double-spaced, one-inch margins and New Times Roman and CONGRATULATIONS! Great post, as always! It IS easy to get discouraged. While many have your back, there are those welding a big-$ssed butcher knife (suspense writer here :)) waiting to plunge it in your heart. But, if it’s your true life’s dream you owe it yourself to beat those naysayers away and go for the gold! Congrats on your big release, love the cover! Yay! Congrats! You’ve earned this moment in the sun. Thank you so, so, so much for this! Right I alternate between feeling like that pulverized starfish and the kid being eaten by the alligator. I too said the exact same thing to myself as you did when hearing how hard and long the road to authorship would be; “That won’t happen to me.” And now, I’m watching myself going through it year after year. But you’re right, you have to love the process and want to be here for the long haul, because every time I want to quit I can’t. I love the words too much. And yes, sometimes I feel like having to do all the added stuff – the platform, the blogs, the social media – I don’t even know where to start and wish it was as easy as just writing a book. But I see it’s not and you have shown me that there is reward in all the processes. So thank you, and congrats on your book, and I’m thinking I’m going to have to sign up for one/or more of your seminars! Congratulations Yoda! 🙂 Book looks great. Just bought, can’t wait to read. THANKS for sharing your hard work and wisdom. I knew this was going to take a while, for me personally I had to overcome horrible spelling, grammar, and punctuation. No skills what so ever. It’s been gosh 2012 so 5 years! Ack. Write, studdy, write, study, read, write, study, read, place forhead on screen and stare at blank page. Bug much of Wattpads cridics for critiques, learn write, learn, revise. Yep that ate up five years. I’m probably stupid too as I refused to give up on the first book and have revised it from then to now. Though I’ve have been carefull not to squash what makes it fun. Imop. Wow 15 years! I’m glad you stuck with it, we need your storys. ? Thst sucked up time too learning it, it is hard to do at times. Guitarist aren’t expected to learn to play right awso why the flaming hells do people still think writing is easy? Okay, 1: You are too cute. These are COMMENTS and a lot of folks type on a phone so I get they are going to have typos and 2: If you don’t rat yourself out I usually fix them for you before approving 😉 . I appreciate the time, love and energy to comment so don’t sweat the small stuff. Lol. Okay. xD On some sites people have a bit of a fit if I don’t say something or will chew my head off. Excellent blog. Congratulations for the published novel AND your sticktoittiveness. I call myself an author. Am I published? If you count my self-published cookbook, well, maybe. But not yet in fiction. I totally get the waiting process, five years. And the social media process. I have a blog. A website. A Facebook fan site. A twitter account. Can I say I use them appropriately? NO. I am either too goofy or politically charged. I need to up my game. In the writing process, my story changed. My main characters haunted me when I slept, they slowly came to life. One of them, I kinda wish… ahem, sorry. I am still learning the craft. It … will … never … end. ‘Til Jesus comes, then I get to be a know it all as all other writers in heaven. I was in the medical field. Was my bread and butter. It sucked the life out of me with textbooks, clinicals, classes, work, single mom-hood. But as you, I wanted to be everything in the world. First, a cowgirl, but the kind with guns (hey, I was five). A writer (a teacher said I had talent, my dad said, not on God’s green earth will we pay for you to be an English major). Then an archeologist, same answer (!!!!!!!!!!!!!!!!!!! *Jurassic Park, Hellllooooooo?). In all reality I am blessed to have been rejected a bazillion times, have harsh but helpful critics–because it forced and still does force me – to look at what I write and look at the floor for those dropped participles and comma splices. Some things I can’t grasp. Like grammar. I’ve read several ugh, trashy novels in the genre I write, wonder how big publishing houses would gloss over glaring errors, characters that can’t jump off the page, 25 deus ex machine per chapter,thin plots, no takeaway- and those times were discouraging (of course this is how I started out, but worse). This from Harper Collins to Bethany House (**why I decided to court an agency**). Since it’s in the agencies hands (for another six months, waiting waiting waiting), I put that one down and started another. It’s as horrendous as my first draft(s)of my first novel. BUT. Don’t we write because we are compelled to, no matter how awful our writing is? Press on to make it a better story? I read the end of my first novel-the waiting in the agency hands one- and still cry. Made my critiquers cry. YAY! that was my goal. Sigh baby, sigh. Make your mama cry(*FIREFLY*). So today, instead of going all political on CNN, oops, already did…I will hit up my blog and tweet something appropriate. Thank you for the inspiration to … wait. LOL. LOVE YOU, your blogs are great. The rest that focus on FB, Twitter and the like tell writers to post averts all the time. Soulds like a built in way to get readers to hate you before you’ve even started! I say be yourself advertise you book in the wsy that you woukd want to be advertised to; inatrusave and not too often. Kudos on launching your novel, which is already residing on my Kindle waiting for my eager eyes. And thanks for the pep talk, which gave me an injection of perspective and resolve. Rock on, Ms. Lamb! Congrats on the new book! I instabought it, and now I’m leaving to dig in. From the time I started drawing breath, I’ve been connected to animals. Lived and breathed cats, dogs, horses, or anything else that moved and wasn’t human. I KNEW I was destined to be a veterinarian. But my grades sucked, because I was too busy riding my horse, or earning a paycheck to pay for my horse’s keep (from the age of 16) to do my homework. At the age of 26, I went back to school. Enrolled in university to finally go for that vet degree, but had to get a bachelor of science first. Hmm. Could barely get passing grades in Chemistry, Physics, and Calculus, but was getting easy A’s in Biology and my “filler” classes like Psychology, Sociology, Poetry, and Creative writing. Twelve years ago, I decided to pursue a lifelong dream to write a book. (I was a voracious reader). I set a goal to write it in a year. I wrote two. And kept writing. Can’t stop. I started self-publishing after 7 years, and the work of getting noticed was daunting. But it didn’t matter. People have suggested I’m not cut out for the marketing portion of being an author, but I don’t care. I keep digging and digging, and sticking my neck out because THIS is what I was meant to be doing. Just like I know I’m meant to share, by teaching workshops to writers. I love it. 1st, big congrats! Thanks for sharing with us the process. 15 years? Yup, did that. I started writing novels age 12. Writing major at a great college, valedictorian. Scholarships then grad school fellowships–though I was flattered away from an MFA into the cutthroat world of Shakespeare studies. No hardship; I adored anything Anglo-Saxon, medieval and Reanissance; I lived for the history of the English language. But the career life? Not so appealing. And job prospects were at a horrific low in the late 80s. But the final blow to my creative writing was a diagnosis of TLE and Geschwinds–the writer’s disease. Suddenly my whole career and very personality were an accident of biology! I felt like a fake. So the bottom fell out of my writing while I set off to find out who I was in the real world. So here I am starting over, the older lady standout among all these young enthusiastic NaNos, and it’s been a blast. OH gosh! I have the same thing TLE. Since age 14. I did manage to get thru college three times (associates, bachelors, masters-just to be clear I didn’t repeat…). Anyway, the change in my medication has freed me from the fog of feeling over-medicated, so that I could pursue writing and everything else. Bakatcha! I’ve come full circle on this thing…Maybe the shamans and mystics of old had their TLE hallucinations AND a hotline to the divine; maybe that’s how it always worked. I credit Oliver Sachs for making me believe a person can be more than a diagnosis even when that diagnosis is inseparable from the personality. A little compassion goes a long way and frees me up to appreciate my “gifts” when they behave as such. Thank you for your inspiring advice. I always like that you tell it like it is. Congratulations on your first novel. I’m anxious to read it, the cover has me very interested! Congrats, Kristen! I’m learning that being published is just the beginning, and marketing your books is a whole other level of learning. The work never ends, it just evolves. I checked out your book. Where’s the part where there’s writing advice? Fiction? Huh?What’s that all about? (Just kidding.) Congratulations! The book sounds great and is in my queue. The roads may vary, but the success is always just as sweet no matter who you are. I’m still plugging along, but celebrate what you’ve done and those you’ve helped along the way. Well done! One thing that bothered me during this digital age is that anyone can be a writer and published their book. It doesn’t have much screening as compared to the past but the advantage is that those aspiring author can finally have a platform to self-publish their books. It is those who engage ghost-writers in making it as their own that bothers me. For example, the YouTubers now are getting book deals just because of their fanbase which is unfair to many serious authors. Yup, Just bought it; cause you said so! Excellent post, Kristen. Much wisdom for authors, new and ‘been there.’ Makes me glad I signed up. Keep on keeping on. Can’t wait for the next post. I’ve thought about writing for a very long time … a very long time. I had an Creative Writing Teacher as an undergrad (early 80’s) that drug my stories through the mud, over the coals, and then shredded them with razors. Deserved? Maybe. But that experience broke my spirit for years. After attempting a career in computer graphics, which was so NOT my calling, I went back to grad school and have now been a veterinarian for almost twenty-one years. It’s been a good run, but I’ve never felt vet med was my calling either – despite the assurances of family members and friends for as long as I can remember telling me I was meant to do the job. Since the fall of 2013, I’ve sat in front of my computer whenever possible and typed, completing my first three works of crap. With my last two efforts I feel like I finally get it. I’ve taken craft courses because I know there is always more to learn. I love spending my off hours writing and getting lost in my worlds. Next step, my author platform, query letters and rejection notices. I have no idea what I’m doing, but like anything else, we try, we fail, we learn, and we talk to people who’ve been there. Hugs on the process but Hoo! Congratulations on the book. Pom-poms madly waving for you and this fab-u-luz step into novel-land! I can so relate to your journey! When I was in college, which was pre-internet days, I was sure that I was going to be a writer. I was even Vice-President in a literary group on campus that the President and I developed for short fiction. Then I was hit by family and other naysayers and the gist of it was that you were never discovered until after you died, like an artist, and there was no way to make a living at it. Be practical, find a “real” job. So, I went through several jobs, mainly in customer service and sales. I hated it! I realized that I’ve always been a free spirit and I felt trapped in any job where I had to be there at a certain time every single day. I was a slave to the dreams of someone else, not myself. When I was disabled, I finally had my freedom to write. I was excited but frightened. I still am. I have no problem writing short fiction. I am working on my first novel, a historical mystery, and I love the research and the craft study, but it has been in my mind constantly since 2012 and I have yet to actually begin writing. I don’t understand why. I have written many notes but no actual start to the story. I have wondered if I should stick with short stories, but I have always wanted to be a novelist. I wonder if this is normal for writers later in life? Most I’ve seen are quite confident. Kristen, congratulations on your Romantic Mystery Thriller! I will buy it as soon as I’m done typing this message. 2) I would love attend a class on a formula for blogging. You are so awesome at what you do, it seems effortless to your audience. I would love a breakdown of your blog in an instructional format. Basically, blogging structure, i.e. your introduction, than your points, and how you bring it home for a rock star ending. If you have already done this, please point me in the right direction of the blog or book, if not, I’d be the first to sign up for that class. Actually I do teach blogging and am about to list a class so just stay posted. I will be in North Carolina next month. Presenting at the Writers Who Run Retreat (No, I am not running 🙂 ). Thanks for the support and YES I can certainly help you out ((HUGS)). Your posts are timely. I admit to taking a big hit in the past week that has balled my writing up, and tossed it across the floor. I’m slowing unwinding the ball of stress to free up my writing hand, but in the meantime I’m glad to come over here and read with friends. Say, is that you on the cover? I have got to the point where I can’t even remember how long I’ve been working on this novel. Years. Lots of them. But expecting 2017 to be the last! Just ordered your book and can’t wait to read it. Thank you for your dedication to the craft. I am halfway through your novel (had to stop at 1 am, seemed reasonable). I LOVE IT LOVE, REALLY LOVE IT!!!!! okay so I used to many exclamation points. BUT IT FREAKING DESERVED IT!!!!!!! I love your voice. I laugh, I cry, I bite my nails (not having touched a corpse …). I love the realistic situations, the comedy of the prophecy and your MCs reaction (I had to read a bunch of this to my husband). I woke up late, drank my coffee, did devotions, and now … back to finish by tonight. When I am done, I will give you a 5 star review (deserves that already) and I love to give a little social media hug to authors I love. Wow! Thanks for making my day/week/month! I really appreciate it! Oh, like I couldn’t comment on the sheer awesome of your work! BTW, I was inspired by Ida’s prophecy to expound in a sort of paraphrase on my blog/website, along with a Biblical reference to the spiritual battle we face: Ephesians 6. Yowsa, it does hit home. FOR so many of us. I personally like Romi’s reaction to being labeled “weak and foolish.” It fit, but no need to give me a paper cut and rub salt in it, LOL. Ha ha! I laughed (while my husband was watching a truly tragic show, gave me the …’look,’) when Romi asked Ida if she was going to speak in tongues. LOLOL. Fabulous post. Loved it. Mega congrats on the new release. Looks awesome. I’m on it. Thanks. Congratulations on the book release! I just downloaded it and can’t wait to read it! I just finished it. You will not be disappointed. I had so much fun reading it, had to read to my husband, and blathered all over my social media. Free PR. Should I ask for a paid position as PR marketer? LOL. It was great. It’s admirable that you recognized your own path and had the strength of conviction to believe in it. And congratulations. Reading about your other professional aspirations, I’m struck by how familiar it is. I once knew someone who loved science, particularly cellular and micro-biology, until she learned that a big part of the field was working in a sterile room, with very little social interaction, and long decontamination periods to enter or leave. I think every profession has its pros and cons, and many underestimate the importance of the cons. The good times need to be worth the price, but we also need to be comfortable paying it. And it’s always nice to be reminded that a long meandering path is not so unusual. Kristen’s novel was full of deep point of view, lots of twists and turns, and altogether a great suspense/romance with a sassy main character. I had to stop several times to wipe tears of laughter away. Anyone not buying her book is missing out. All her great advice is wrapped into her fictional characters, surroundings, etc. I wouldn’t plug a book if I didn’t believe in it. As a writer too, I think it is seriously important for us to read/support other authors. Read as a reader. I have seen authors go onto amazon and trash work for things a reader would never look at. BTW good luck finding anything wrong with Kristen’s book. It doesn’t matter the genre for me, if I like the writing style, I read it. I happen to like her genre and that’s a total plus. I like S. King, too, but despise his genre. So when you get 1. the genre you like 2. deep point of view 3. humor/sarcasm/witty 4. great timing 5. well-written (and I could go on), I might say no batter hits like that. Don’t just congratulate, please. Those are great words, but if you read, give a review and plug it, that makes an author’s day. I hope someday when I am published, authors will do the same for me. Word of mouth is the best PR. This has to be one of your best posts yet – or maybe I just think so because, yeah, I’m a writer. Anyway, I found so many things I wanted to quote that I’m just going to share the whole post. Great stuff here!! C–my reading season is so crowded already right now! But you’re making it really hard to put off this one…Nice job. And good points. It really is good to see a fellow writer move ahead. Even if I never publish, giving this kind of support is still a fun way to share. True! It’s inspiring to see the success stories of ppl who have worked the craft into perfection (did you see on Amazon she got a review from Joel Eisenberg?!?!?!?) and have the patience of a saint. I agree, while I never give up, I may sigh, but always support authors. It is not an easy job. Like K says, great gig if you get it. Big question here, this is probably stupid question. Did you put MS aside or send it on every 3-6 months to new agents/PHs? I heard one person had waited (actually, gave up) and was accepted 23 years LATER!!! GADS by that time, I’ll have dementia, read the book ten times and have no idea who the writer is … was..
Randomness! I think a poem contest would be fun. At 74 yrs, I’m wondering if I’ll have time to finally get this craft good enough to be published before I croak! ? Four novels under the bed (plus 1 discarded) & I’m editing the fifth. There is truly so much to learn about this art of writing. Cheers on your newly published novel! it’s never too late! You are already ahead of the game with five novels–four maybe under the bed but they are simmering, bursting at the seams to get out there. Your characters are thinking on how to thwart you! They plan, plot and refuse to do what’s right. You get to be the marionette of them, ha! Don’t give up. I too am getting up there. No. Really. And I am just on my second novel. If just one gets out there, that would be awesome, however scribbling feeds that insatiable need to write and do what I was meant to do, what I am driven to do, and answers that question: why I was knit in my mother’s womb with this purpose-whether it makes it in any fashion, or not. Once again, Thanks Kristen for sharing your path and struggles on becoming published. I especially appreciate your mentioning that we have to love the process, or we might as well go find something else to do. Apparently I love it enough to stick it out, because I started my novel sixteen years ago, and it has now turned into a series of 5 books. Between following the advice of people like you, and my wonderful, yet brutal editor who is always pushing me, I am starting to actually enjoy the process. Every time I learn something new in this industry, it takes some of the mystery out of it, and therefore the fear as well. Thanks for keeping it real. Thanks so much for this post Kristen. I have been writing for a long time too and my first book is almost complete. There are many half written ones in my desk drawer!! But you give me hope that I will get there. And I know my writing has improved so much in that time. My first “book” took 25 years to finish. And it’s been hiding under the bed since then. My first “real” book took 4 months to write and 18 months to be published. The difference was several years of craft, conferences, workshops, critique, and books on the same. Knowing what I didn’t know. I’m still working on the next books, and the first one recently crawled out from under the bed to say hello and ask if it could finally come out and play. Writing is hard. Anyone who says differently probably isn’t a writer, or at least not one who gets paid for it. Thanks for your informative, and always fun, blogs. This is why I do everything to teach you to work smarter not HARDER. 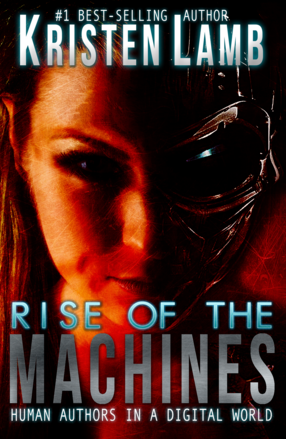 And if you read Rise of the Machines? I talk about Autumn and Winter Writers, those who are starting later in life and I lay out all the advantages YOU guys have that the young folk do not. So you can do it! You are already way ahead of the game with so many years writing and being beholden to deadlines. And yes fiction IS a whole other ballgame. *fist bump* I was in the same spot. Great at copy, tech writing, non-fiction and essays but fiction? *bursts into flames*. It’s why I spend a lot of blogs and classes teaching it because I might as well have ben trying to learn Sanskrit. I do recommend my upcoming class Plotting for Dummies or just peruse the archives. LOADS of free help. 15 years? Hmmmm… I’m 83. Published first book at 81, second last year. Working on third and plotting a fourth. I guess I better hustle. I am very glad you took the longer path as I’ve found incredible wisdom and support in your blogs…which I’ve only just discovered! I can definitely support that it’s a process, and it’s one I’ve just started learning. Thanks for the continued support and information!